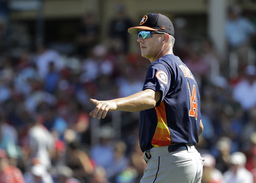 WEST PALM BEACH, Fla. (AP) Houston Astros manager AJ Hinch called umpire Angel Hernandez "unprofessional" and "arrogant" after being ejected in the first inning of Friday night's split-squad game against St. Louis. Hinch was tossed following one pitch in the bottom of the first inning. "The fact that he wanted to throw me out in a spring training game is pretty ridiculous," Hinch said. "He's known for overreaction a little bit." Hinch's postgame comments angered Hernandez. "He said that? Write it," Hernandez said before adding, "No comment. He got ejected for arguing balls and strikes. That's it." The argument could linger beyond spring training. "I'm sure we'll revisit this in-season," Hinch said. Hinch said about a week ago Hernandez told him that he gets about four ball-strike calls wrong per game. After a few of those calls didn't go Houston's way in the top of the first inning, Hinch said he calmly made a suggestion to Hernandez as the Astros prepared to bat. "We have technology to help you get better and that these pitches are strikes," Hinch said he told Hernandez. "He had kind of an arrogant attitude about it and didn't want to hear it." When Hernandez called the first pitch to Astros leadoff hitter George Springer a strike, Hinch said he thought Hernandez probably made the call out of spite. From the dugout,Hinch said he yelled to Hernandez that he'd used up his allotment missed calls, prompting the ejection. Hinch emerged from the dugout and began a lengthy and at times heated conversation with Hernandez at home plate. "When you argue balls and strikes you get thrown out, I get it," Hinch said. "As it escalated, he said some condescending things that are inappropriate, unprofessional. I'll leave it at that and we'll move on to the next game." First base umpire CB Bucknor attempted to intervene, but Hinch wouldn't leave the plate area for more than two minutes. At one point, Hernandez clapped his hands as if to say let's go, argument over. Hinch mockingly clapped back at him. "I should thank CB. He was the voice of reason in all of it," Hinch said. "CB was super calm about it, he just wanted the game to continue." As Hinch grew more agitated, he was restrained by both Springer and coach Alex Cintron. Hinch appeared to bump both Hernandez and Bucknor at least once each. At one point during the argument, Cardinals starter Daniel Ponce de Leon elected to throw a warmup pitch, doing so while Hinch stood in the right-handed batter's box, his back to the plate. Hinch stopped to talk for several seconds with third base umpire Mike Estabrook on his way down the left field line to the Astros clubhouse. Hernandez came under scrutiny during the AL playoffs last year when he had three calls at first base overtuned by replay during a Red Sox-Yankees game in New York. Hernandez, 57, joined the Major League Baseball umpiring staff in 1993. Hinch said he considered making the 15-minute drive to Jupiter where the other half of the Astros were playing a second split-squad game against the Cardinals. "I didn't think about managing it, but I thought about showing up and shocking, the whole side of that," Hinch said. The Astros' side that Hinch had been managing won 5-0. The other squad of Astros beat St. Louis 11-2.